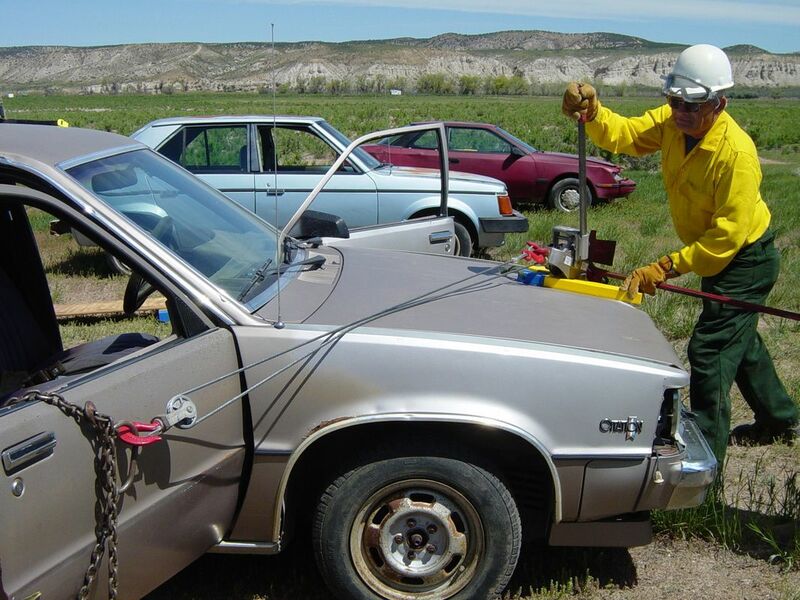 The Model C-2A, 2 Ton Rescue Come-A-Long™, frequently referred to as a cable puller, hoist or a hand winch is designed and constructed to meet the rigid specifications of, and approved for use by EMERGENCY SQUAD TRAINING INSTITUTE, inventors and designers of the highest quality, American Made rescue and extrication equipment. This heavy duty pulling and lifting device is designed and specially constructed to meet the demanding requirements of extrication and rescue. The C-2A, 2 ton Rescue Come-A-Long is a hoist designed for overhead lifting and pulling with a two part line. The cable puller is manufactured utilizing a high strength cast aluminum alloy housing with stainless steel springs, self lubricating bearings, extra flexible galvanized steel aircraft cable and 360 degree swiveling hooks constructed of drop forged, steel hooks with safety latches for positive load engagement. All C-2A Rescue Come-A-Longs are Made in America to stringent ISO 9001:2008 Standards, and ASME/ANSI Standard B-30.21. C-2A, 2 ton Rescue Come-A-Longs are non destructively factory tested to 150% of rated working load capacity unlike our competitors who only test to 125% of rated working load capacity. The C-2A, 2 ton Rescue Come-A-Long is a heavy duty rescue hoist designed for overhead lifting and pulling to meet the demanding requirements of fire and rescue professionals. This is not to be confused with an imported or hardware store type Come a long which is not designed for overhead lifting! The proprietary, quickly reversible, handle switches positions in seconds, allowing for a downward pull when lifting or moving an object or load. The handle may be inserted into the bale from either direction, permitting easy access and operation in tight places. The handle can be easily removed to prevent tampering with the hoist or load. The proprietary reversible handle is rapidly removable and quickly replaceable.The handle is designed to bend on severe overload, to protect the user from injury and protect the hoist from damage. The Come-A-Long handles are designed to bend when they are subjected to a 20% to 50% overload. The bending of the handle provides the operator with a visual warning to stop immediately and reduce the load before the C-2A Rescue Come-A-Long is damaged. Each Come-A-Long is supplied with two handles to permit a rapid return to service after an overload situation. The exclusive cable/drum anchor system utilizes a steel swaged ball shank terminal which locks the cable securely in the drum and allows full extension of the cable. The exclusive swaged ball shank terminal, eliminates the use of two set screws and the requirement to maintain 2 or 3 wraps of cable on the drum to hold the cable on the drum as required by other manufacturers. The drum design and guide system practically eliminates "birds nests" and cable crushing on the drum. All of the cable stores on the drum. With a two part line, the cable, constructed of 7x19, ¼” diameter, 133 strand, high strength galvanized steel aircraft cable provides an unequaled full 10 feet of lift or pull on a 2 ton load, and a single part line provides 21 feet of lift or pull on a 1 ton load. A very short hook to hook distance of only 26½” inches, and a total weight of a 15½ pounds, combine to create a cable hoist with the longest pull, shortest length and lightest weight in its class. A reversing lever is provided to permit lowering of loads one notch at a time. The unloaded cable may be stripped from the drum by operation of the “Quick Release” lever to permit more rapid positioning when attaching to the object to be pulled or lifted. 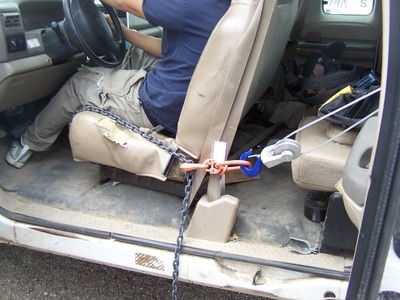 To protect the operator from a sudden dropping of the load, Internal safety devices will not permit “free-wheeling” when a load or tension is applied to the cable. Marine grade models were developed specifically for harsh marine environments and other corrosive conditions. Marine grade models provide the same capacity, design and features as the standard models. The C-2A-M, Marine Grade Come-A-Longs have an anodized aluminum frame, stainless steel cables and springs along with cadmium plated steel shafts to provide corrosion protection and a long life for Come-A-Longs subject to the corrosive marine environments. The C-2A Rescue Come-A-Long provides a full two tons of pulling capacity, longer cable pull reach, shorter hook to hook distance, lighter weight is achieved with our high strength aluminum alloy frame. Less force application is required than competitor’s models. The C-2A Two Ton Rescue Come-A-Long is provided with blue color coded safety latch hooks and handles to permit rapid identification of it's 2 ton capacity when using a two part line without the need for looking at the data plates. On a single line pull this hoist has a 1 tone capacity. The unloaded cable may be stripped from the drum by operation of the “free wheeling” lever to permit more rapid positioning of the Come-A-Long while attached to the object to be lifted or pulled. To protect the operator and the load being lifted, Internal safety devices will not permit “free wheeling” when the load or tension on the Come-A-Long is greater than 40 lbs. Based on user feedback, we have updated the design of the cable guide. The new guide (part number 753) increases the durability of the part and makes it easier to replace if it is damaged. The reversible handle attaches directly to the drum for slack cable take up. Our exclusive steel swagged ball shank cable retention system allows the operator to utilize the entire length of the cable and pull the full rated capacity of the Come-A-Long without the need to maintain two or three wraps of cable on the drum like other manufacturers require. A steel cable eye protects the highly flexible 1/4" 7 x 19 aircraft cable at the hook attachment with a large hydraulically crimped copper sleeve used to secure the cable in the eye, unlike other manufacturers who use an aluminum crimp sleeve..
Safety Latch Hook 360° swiveling hooks with safety latches for positive load engagement are standard. Removable Clevis Hook is available. The 360° swiveling Clevis Jaw fitting provides absolute attachment with high strength steel jaws and screw pins. Gate Hook option provides a 360° swiveling hook with a latch that revolves on the hook shank and locks under spring tension in open or closed position. All hooks are drop forged AISI 5140 alloy steel, greatly exceeding the 4:1 industry standard. A one year warranty is provided against defects in workmanship and materials. Shipping weight 21 lbs. Ships via FedEx Ground ®. 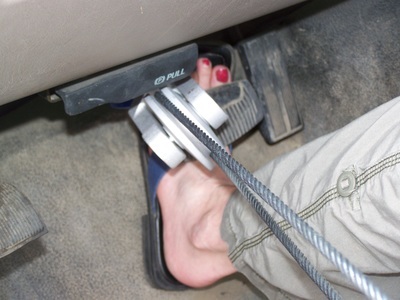 Come-A-Long used to pull a break pedal releasing a Come-A-Long & chain pulling a seat rerward to access trapped foot. patient. C-2 Come-A-Long and C-1chain set used in combination, provide up to a full 2 tons of force to pull both front doors for patient access and removal.